Finished Jun 2018. Final score: 5 / 5. I'm a fan of Brandon Sanderson, and I wanted a story in a single book. Apparently, The Emperor's Soul was set in Elantris. I did not realize this until later. This might be my favorite standalone fantasy novel. This book was masterfully crafted and executed. I am stunned that this was Brandon Sanderson's first published book. On top of it all its excellence, it is completely standalone. So rare to see that. This book has everything. It covers politics, religion, love, loss, magic, character growth, etc. It starts with Raoden, the beloved crown prince of Arelon (the Kingdom just outside Elantris). Raoden is engaged to be married, but just days before the big day, he starts transforming in to an Elantrian - a once godlike group that is now cursed for reasons I won't cover. 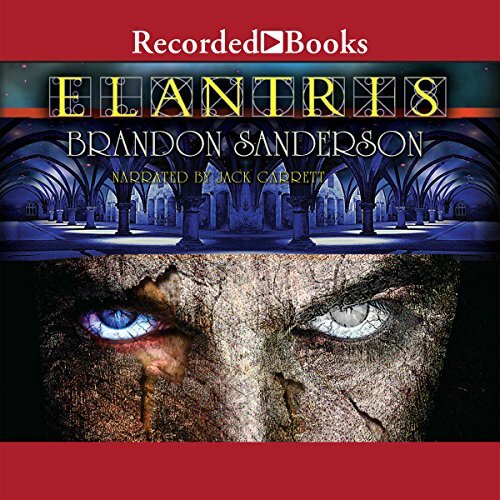 Raoden is banished to Elantris. The King announces Raoden died due to a sudden illness. His bride, Sarene, the princess of Teod, arrives. Due to a quirk in the marriage contract, she now a widow before she is even married. This makes her both a princess of Arelon and Teod. Interesting politics come from this. She is of uncharacteristically strong will and opinion. She has swift thinking and a fighting spirit. Next, is Hrathen, a high priest. His task is to convert Arelon (and Teod) to the Shu Dereth religion by hook or by crook. Hrathen's struggles in these tasks, plus the way his is thwarted, are the best subplots in the book. Dilaf is Hrathen's fanatical helper. Part of Hrathen's struggles is dealing with Dilaf taking tasks to their religious extremes. Lets get the most obviously plot point out of the way: The princess and the prince weren't able to marry. The princess thinks he died while he was actually just banished. Gee, I wonder what will happen at the end? Fortunately, like my praise for other great novels, this slice of predictability was minor and forgivable. Major portions of the book happen inside Elantris with Raoden (mostly in misery trying to make a better life) and just outside in Arelon with Sarene thwarting Hrathen's political maneuverings. It is hard to pick out what made this story so good to me without dropping spoilers. Perhaps it is that every interesting avenue related to a bride thinking her groom is dead was explored. Perhaps it was age-old struggle of the King versus the Church. Perhaps it was actual character growth. Perhaps a strong woman lead character. Or perhaps it was, as Brandon Sanderson suggested in the epilogue -- The hero was very likable. It was not someone with a difficult past. It was just a guy trying to do what he felt right. In the epilogue, Brandon Sanderson describes himself as "a single draft writer". He does a lot up-front planning, and the actual writing is the final step. However, this particular book actually took a dozen drafts. It shows. Everything felt very tight and all story arcs were resolved. It moved along at a nice pace despite the book being fairly thick. Any fan of high fantasy, particularly anything by Brandon Sanderson, should pick up this book. Discuss Elantris in the forums.